"The poor mans space program"
Amateur Radio High Altitude Ballooning is the premier site for near space explorers and enthusiasts dedicated to the education and study of aerospace science via Amateur Radio High Altitude Ballooning. There are no membership requirements short of an interest in becoming an aeronaut and a willingness to share your experiences with us. Very few people have images from the edge of space in their personal photo albums--snapshots in which a hazy blue atmosphere hugs the curve of our planet against a backdrop of the black abyss beyond. But of those who do, many are amateurs, average people, taking regular trips deep into the stratosphere and peering out from the edge of Earth. Their hobby, high altitude ballooning has been called the "poor man's space program," because they are probing an environment more similar to that found on Mars than to any down here on Earth. 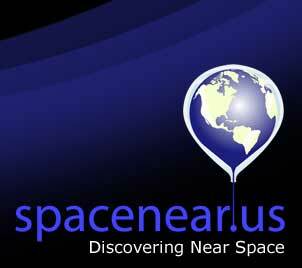 Near space is that region of the atmosphere above 60,000 feet but below the accepted altitude of space, 328,000 feet. These altitudes make near space far more like earth orbit than the surface of the earth. Air pressure in near space reaches 99% of a vacuum or better. Air temperatures drop to a low of -60 degrees F or colder. Cosmic radiation is over 100 times greater than at sea level. Near space is located within the ozone layer and therefore is an environment of increased damaging ultraviolet radiation. Near space is reached by helium or hydrogen-filled weather balloons. Since it is far less expensive to send payloads into near space than earth orbit, organizations like NASA will send new designs into near space first, as a test.